Halloween has always been my favorite holiday. Ever since I was a kid I’ve loved making my costumes and dressing up. And of course, they have only continued to get more elaborate over the years. 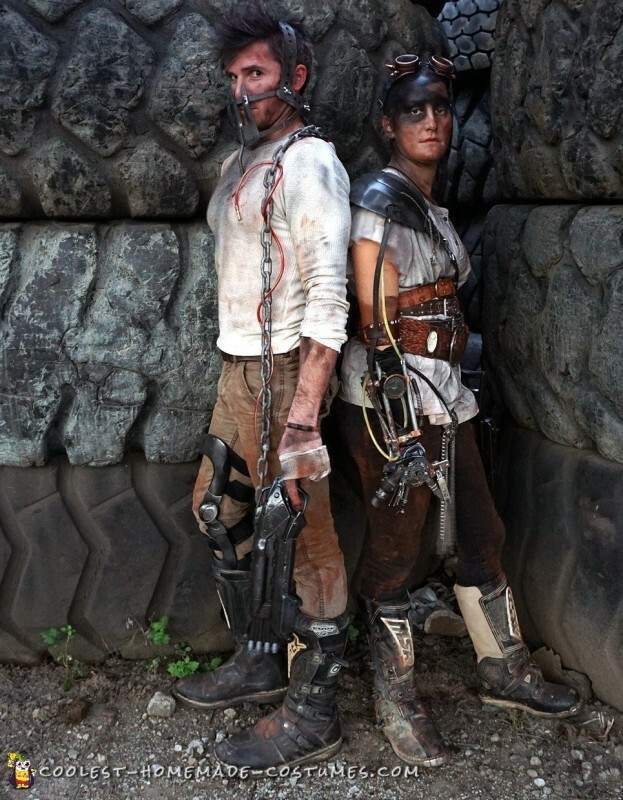 I was having trouble thinking of what to be this year until I came across an article about the second Mad Max movie’s production. I had seen the original with Mel Gibson and more recently Fury Road, which was nothing short of incredible. My mind was made up, I was making Mad Max Fury Road costumes. Next up, I needed a Furiosa. I asked Missy, my best friend and a sister to me, what she was was going to be. When she said she didn’t know, I immediately sent a picture of the movie poster with Tom Hardy and Charlize Theron. 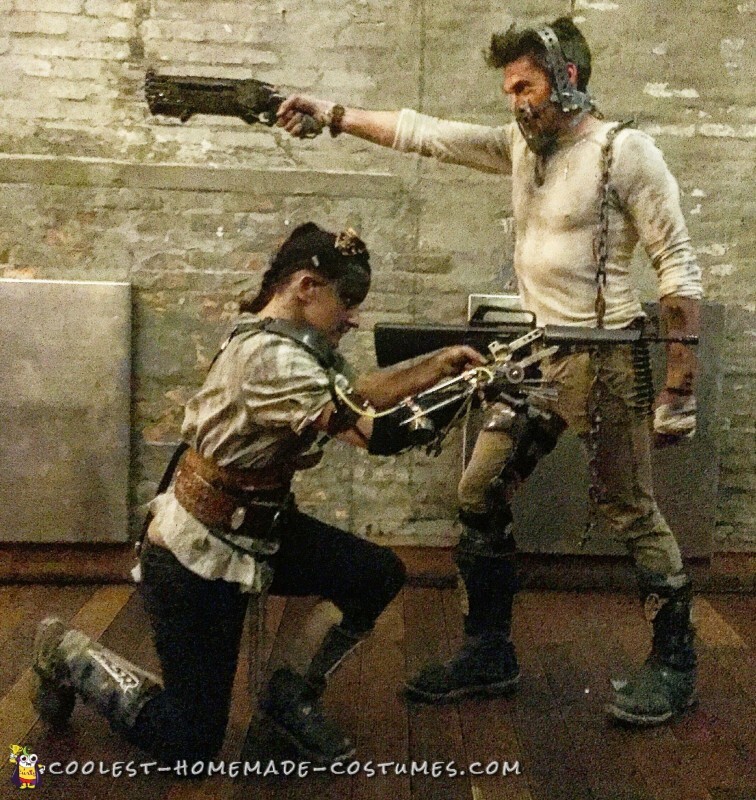 And that’s when our Mad Max Fury Road costumes began. The mask was the centerpiece for my costume. I built it with a small garden rake and various steel rods from the hardware store. Then I proceeded to hammer, bend, cut, and drill them in order to shape into place. The final product was three pieces which had to be put on my head separately and connected with bolts and wing nuts. The chain was attached to the back through a U bracket and hooked under my shirt to a bungee cord attached to by belt to ease some of the weight. The final piece was the blood line which was made of clear tubing, fake blood, and plumbing fasteners and threaded through the chain. The mask was the most challenging part of the costume, specifically molding the mask to fit my head and face. Every little adjustment caused a change somewhere else and when you are dealing with a heavy metal cage on your head and next it tends to become quite uncomfortable. 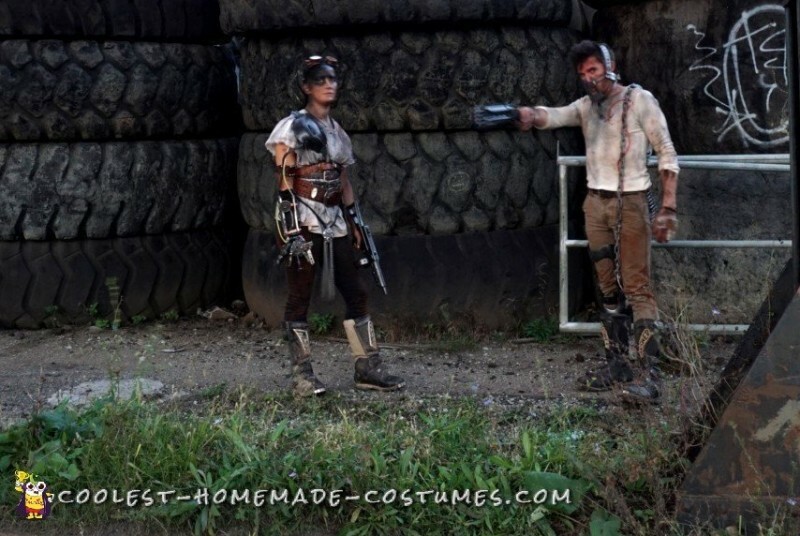 The focal point of Missy’s costume was the robotic arm. Naturally, the first stop was our local construction thrift store. We filled up a cookie tin of random junk and walked out having spent a grand total of $5. I started the hand with an old kitchen cabinet handle screwed to a piece of metal. This allowed her hand to slide in and out. We then pieced together the random robotic items which made up her fingers. A cabinet hinge, garden hose, metal rods, mechanical gears, copper wire, and sink drain were all modified and attached to the base. We then made the forearm from old wrench, metal pipe, plumbing fasteners, springs, and of course, pressure gauge to finish it off. The “hydraulic” tube was clear tubing filled with a custom green paint. The arm pieces were then attached and held up by an old football shoulder pad. Multiple belts from the thrift store were used for her torso and to attach the various padding. She used different jewelry chains to hang from the main belt buckle and pendant. For both of our costumes we pulled together some old clothes. Then we used spray paint and clay from the local baseball diamond to distress and dirty them up. We used old dirt biking boots to complete the outfits. My knee brace was lying around from a previous knee injury. So that just needed some paint and was good to go. Nerf guns were also painted to finish them off. All words used by others to describe us when we walked down the street. 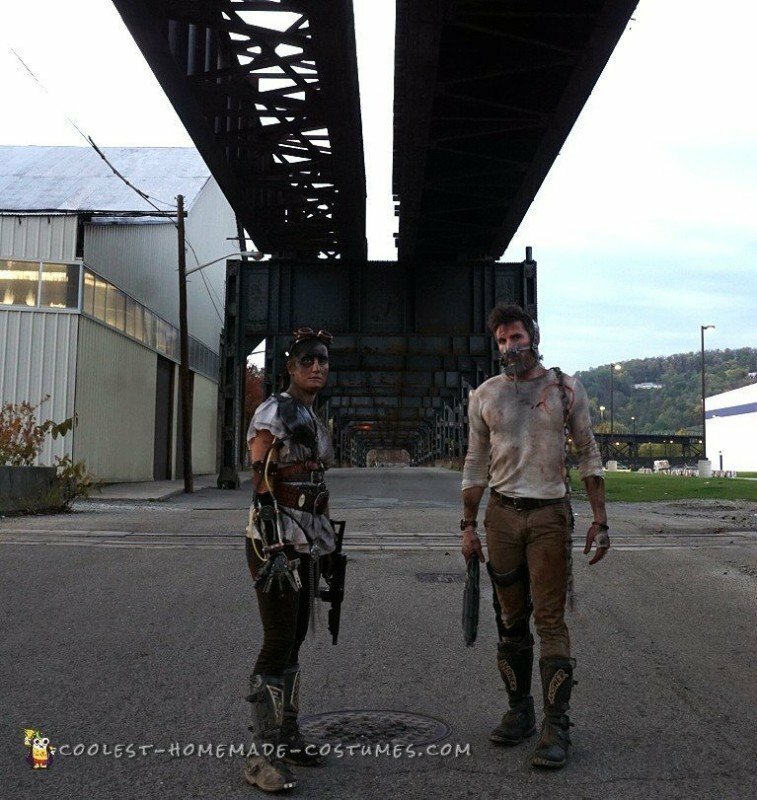 After the initial reactions we had people ask where we bought the costumes (we didn’t), if we worked for one of the professional movie production companies in Pittsburgh (we don’t), and finally how long it took us to make them (about 20 hours). The entire costume was assembled in my basement workshop over a three day period leading up to our friend’s Halloween party. We had friends stop in and out and see different portions of the construction. But, it mostly looked like a pile of junk and scrap metal until the final assembly. We had spent so much time together making the costumes that we would make adjustments to each other’s before the other even knew it was needed. On a final note, I would relate the wearing the mask to what I imaging wearing a 15 pound bear trap on your head for 10 hours feels like. So needless to say, it was not the most comfortable thing I’ve ever worn. But the reactions made every second worth it.